Kinda/sorta. Actually, a show like this is very difficult to spoil, because it changes. But I'll get to that in a moment. Remember when you were maybe thirteen years old? And you had this great idea of a party? One where you'd get to celebrate all those horror movies and monster comics and weird stuff you loved? Of course you didn't have any money, but if only there were some basement or attic room--a place to set up some black lights and enact some really cool creepy stuff from the Halloween Haunted House last year, but this time with some friends who really understood? I never had that party, for a whole host of reasons. Probably only a very few of us ever did. But this show--Karaokeapocalypse at ZJU--is exactly that event! 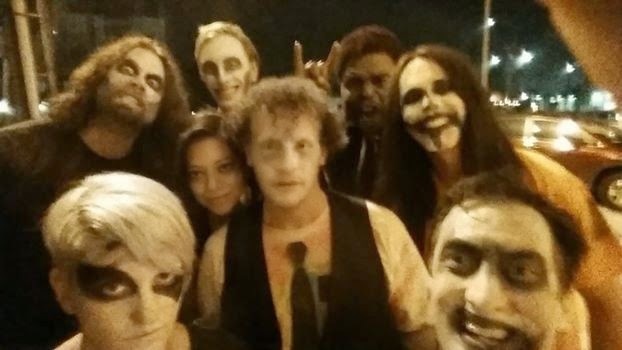 We have a cast in ordinary, grungy clothes, wearing ghoulish if generic makeup. We have spooky music to dance to--sung live and sometimes we the audience joined in (at one point given makeshift musical instruments). Action figures re-enacted a cheesy movie, followed by a werewolf puppet singing a song. Games and dance. Posters used to set the mood exactly the way we imagined doing so way back in our early teens. But I cannot give you a cast list per se, because each performance will have a different cast! Each show will consist of different, fresh, fun and (yeah, let us say it) a little bit sophmoric "acts." Which is the whole point! In Australia, where December falls squarely in the heat of summer, there's a holiday called Christmas in July. That is really what this show ends up as in many ways--Halloween in Spring! Therein lies the key to the essential question every theatre review seeks to answer--should you go to see this show? It all depends on how much you like Halloween. Does this kind of party sound like fun, keeping in mind it isn't run by a bunch of barely-teenagers who don't really know what they're doing? No, these folks are theatre professionals and having a great time. You're invited to come along. To listen to recordings of Vincent Price and sing "They're Coming to Take Me Away" and just relax. Halloween revisited. Me, I had a blast! All me to be brutally honest here. Not mean or dismissive but up front and sincere. In the last few years the notion of a "ten minute play" became very popular with lots of theatres. One can easily see why! Logistics for one thing--less rehearsal, less demand of attention from an audience weaned on sitcoms and music videos. Me, I find it very hard to get much out of ten minutes. Very hard indeed. But far from impossible! TV Live at ZJU in North Hollywood is a collection of these plays, all written by a friend of mine who quite frankly I regard as a very good playwright with an interesting, entertaining and often insightful voice. His name is Adam Neubauer. And if I claimed to be disappointed or that I didn't enjoy myself, that would be a total lie. I enjoyed myself quite a bit. The five plays (or playlets) gave me plenty of reason to smile, to raise an eyebrow, to nod while recognizing something I didn't know I knew. Really, this was very nice. Get Right (directed by Roger K. Weiss) stars Kurt Cotton, Evan Henderson and Chelsea Collins in what amounted to a strange triangle, one not based on romance really but obligations of friendship. Gonna Live Forever (directed by Mark Hein) features Justin Banek, Mason Kale and Inetri Brazil as three people at a bar reacting to a startling claim by one of them, that in turn brings out all kinds of truths from the other two. 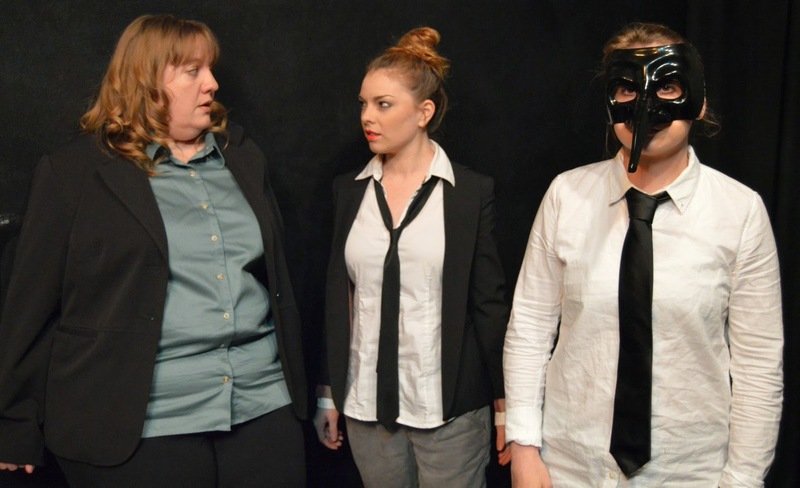 Box 4815 (directed by Adam himself) follows a bank robbery veering into tangled and dangerous mine field of conflicting goals--with Julie Inmon, Sarah Shankman and Kyle Marie Colucci. Club Mirror (directed by Jana Wimer) sees Sean Sekino, Randy Marquis and Mariya Pesheva give us a glimpse of a kind of deeply dysfunctional triangle with echoes of violence and deceit. A Mid-Morning Conversation (directed by Denise Devin) is the one playlet with a two character cast--Dorian Antonacci and Rachel Scorpio as a seemingly perfect couple in an almost Barbie and Ken kind of way, which all turns out to be so very much darker than that! talent and several that mastered the tricky art of doing next-to-nothing with profound truth. Parenthetically, I note that Neubauer's voice as a writer has its own peculiar rhythm, one only he himself managed to capture pretty much perfectly. Which doesn't change the overall quality of these performances and mini-productions. more we'd like to know. Left us wanting more, good theatre and storytelling technique! But I did want more. A lot more. The glimpse was tantalizing. I recommend the show without hesitation. But I want more than ten minutes from this writer. I want at least nine times that, so I can see what lies behind these amazing glimpses of back story and character, so I can wrap my head around what is happening as if it were more than an SNL sketch. There's an extraordinary talent and ability here, but instead of a wonderful meal all I'm getting from this is h'ordeurves. Very good h'ordeurves, let us be fair. 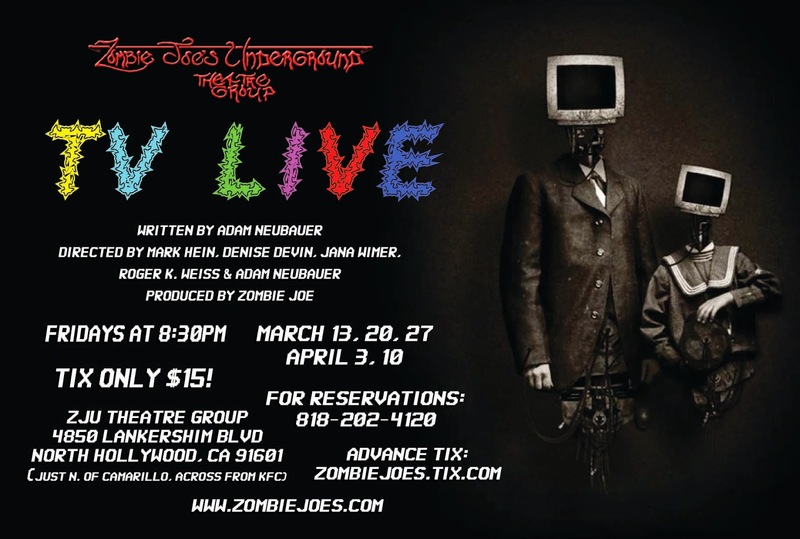 TV Live plays Fridays at 8:30pm through April 10, 2015 at Zombie Joe's Underground Theatre at 4850 Lankershim (just south of the NoHo sign), North Hollywood CA 91601. Tickets are $15 and reservations can be made by calling (818) 202-4120 or by going to zombiejoes.tix.com. The term "variety hour"feels retro in this day and age. It used to indicate something quite fun, a collection of different acts and entertainments, part of a tradition going back to Vaudeville and the Victorian Music Hall and before. The Bedlam Explosivo Variety Hour at ZJU in North Hollywood recreates this idea. Which is not to say it feels anything like an antique. No, this remains modern, remains ZJU which is to say it has equal doses of the macabre and edginess with more than a few dashes of dark(ish) humor plus a bit of gender-bending here and there. When I went to see it, a friend who was helping with the house told me I looked like I could use a night of relaxation and fun. She said this show was for me. Well, she was right! Live music accompanied several musical numbers, which naturally enough included more than a few scantilly clad performers. Most (but not all) of them female. Dance and singing made up a goodly percent of what we saw--much of it with a twist! A translation gone horribly wrong from Carmen for example. An all male striptease involving monks, a long running gag from Monty Python and music from the group Genesis for another. We also got a lovely striptease number done to classic opera (courtesy of the lovely Vivi Varon)! Meanwhile what other acts made us laugh, and smile and sometimes nearly dance in our seats (although maybe that was just me...)? Elif Savas showing off a really fine vocal range along with a very fine gift for comedic timing. This is no small thing, since making some of her "bits" work isn't anywhere near as easy as it seems. 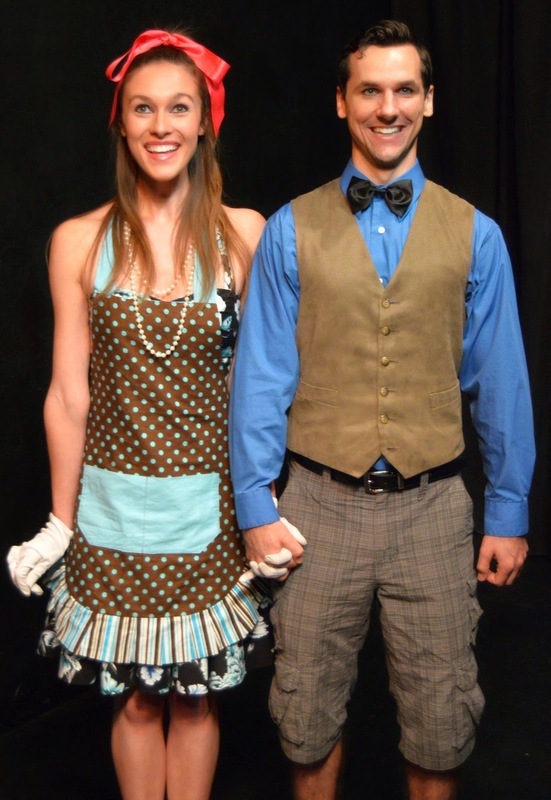 She and Matt Hislope also did a hilarious bit about a plumber and the tools of his trade. I really cannot describe this, but note you should see it for yourself. Really. Michael Guthrie's singing, who gives us not only the power of a good strong voice but the skill to let us hear, understand and (important) feel the words! Jennifer Chun--the very first performer we see--acting by playing the cello (for real). Allison Fogarty doing the same while playing the flute, maintaining a specific character throughout (this is good stuff). Ellen Runkle and Emily Craig who shone in a simple little skit that left me snickering and who throughout created a series of small, but vivid characters in one bit or sketch after another. Mostly though I was truly impressed with Sebastian Munoz, a director I've followed now for several years and seen his skills with choosing talent and shepherding good performances (and in this work, working out humor that works) continue to grow. I recommend this show highly for sixty minutes of fun! 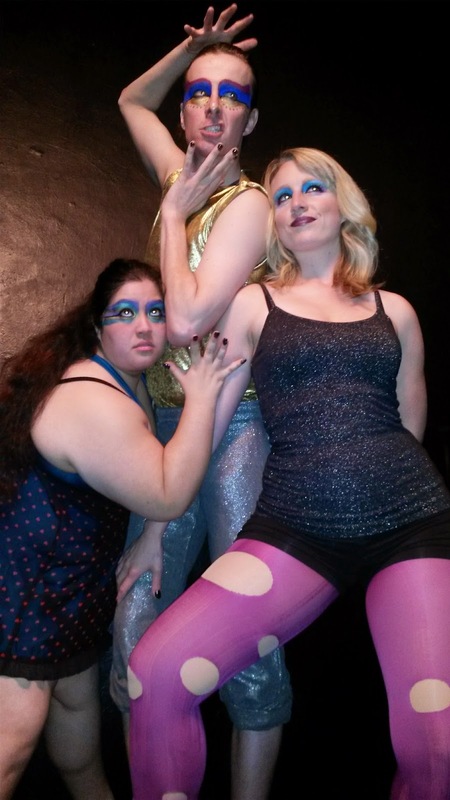 The Bedlam Explosivo Variety Hour plays Saturdays at 8:30pm through March 28, 2015 at ZJU 4850 Lankershim Blvd (just south of the NoHo Sign) North Hollywood CA 91601. Tix are $15. 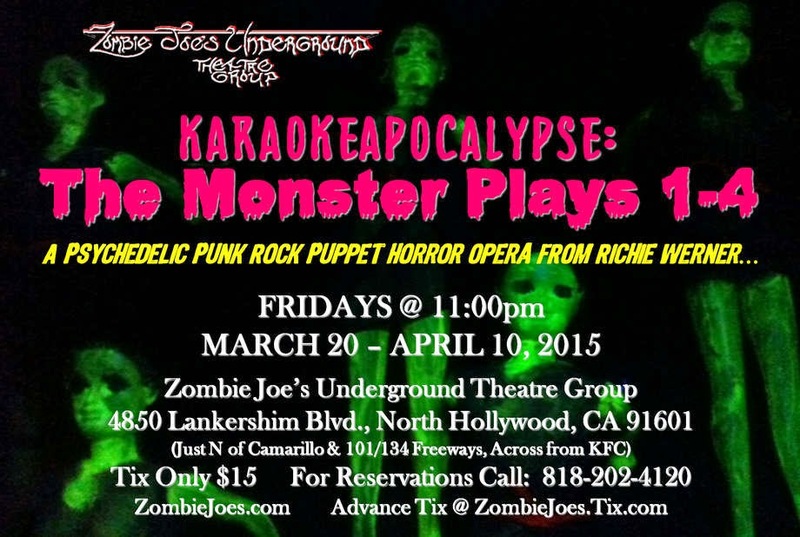 You can make reservations by calling (818) 202-4129 of visiting zombiejoes.tix.com. Must say it feels a little bit like kismet, this spattering of theatre lately entwining fictional events with real history. 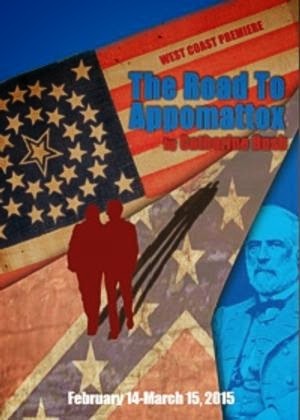 The Road to Appomattox by Catherine Bush enjoys its west coast premiere right now at the Colony Theatre in Burbank. By some very nice good fortune I got to see this show, which essentially comes down to an extremely nice staff at the theatre itself. Really, very nice. So is the building, the seats, the decor of the lobby (highlighting photos and set designs from years of shows)--even nicely priced snacks and drinks at the concession stand. All this is intended as both praise and criticism--neither extreme, but both heartfelt. The Road to Appomattox (according to the program) was commissioned as a play about Robert E. Lee, one of the most famous and powerful figures in American history. 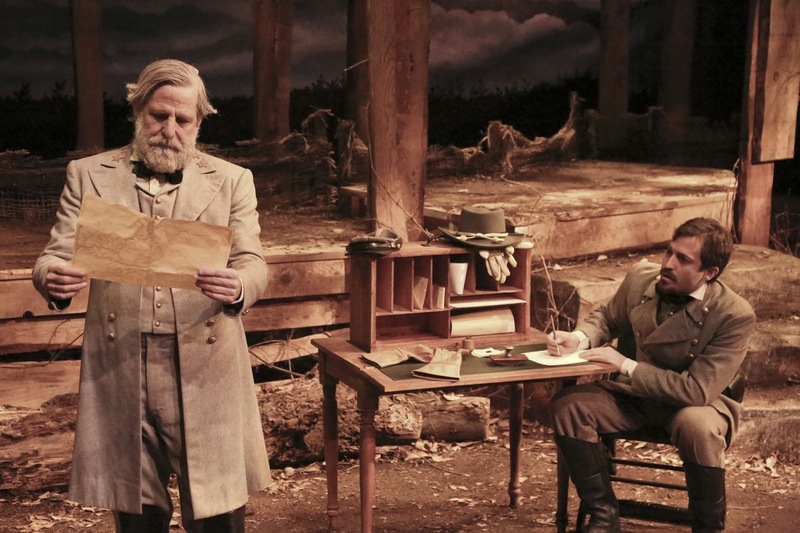 What playwright Bush decided to do (and I've nothing but congrats for this choice, it being near and dear to my heart) is interplay a few specific events at the end of the Civil War with the current day lives of those tracing those events, which echo in a way their lives. What a marvelous idea! How lovely to see enacted the relationship between past and present, history and our day to day lives. That a character comes out and says as much is frankly indicative of what I found disappointing. Not horribly disappointing! Sitting there in the really very nice theatre (honestly, I felt such envy for that space) I enjoyed myself. The play never stopped entertaining, no small feat. Kudos! The dialogue sparkled at times, the story followed through on its ideas to a logical and emotionally touching conclusion. I genuinely liked the characters. Sometimes I wanted to slap them! Other times they cringed on their behalf! By the end my heart wanted the best for them. This is all to the good, yes? Of course! Yet I honestly feel the script itself pulls its dramatic punch in all kinds of ways. The central characters, Jenny (Bridget Flanery) and her husband Beau (Brian Ibsen) clearly are a marriage in trouble, with the latter searching for something and the former trying to help, but both of them going in blind. Yet in the end, when we're given the so-called reason for the trouble, all I could think was "Is that it? Really?" It seemed so mundane, so fixable with a good talk and a bit of hard work, a surface problem at most. Nothing really deep there, no hint of more fundamental problems or issues or even questions. This tiny domestic problem, pleased as I was to see it resolved because Jenny and Beau seem nice enough, just did not measure up the grandeur and scope of the Civil War. In fact, this comparison diminished that conflict, which cost so very many lives and wrecked so much of this country, leaving scars that continue to bleed today a century and a half later. Where was the scope? The depth of the issues involved? Where a comment on the human condition beyond a platitude worthy of an (above average) birthday card? 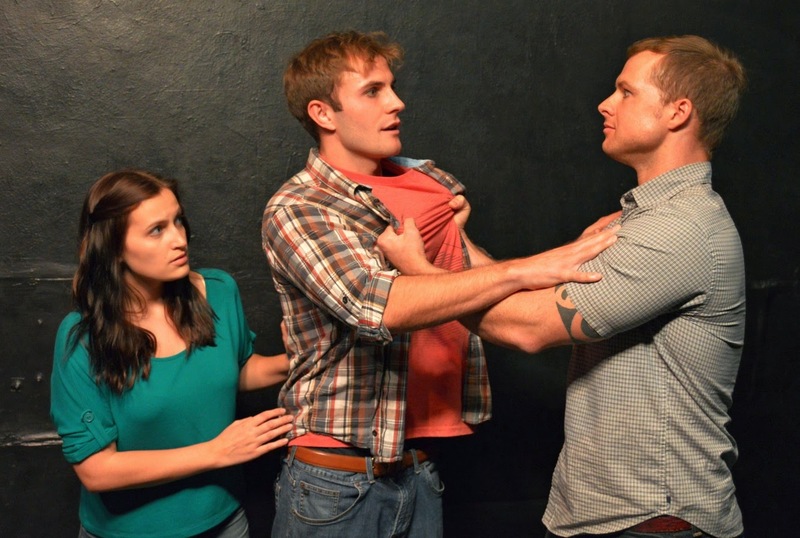 Chip (Tyler Pierce) plays the third wheel and not-quite-third-point in a not-really-triangle, a history professor who in the later part of the second act talks about what caused the Civil War. That bit of dialogue actually felt insulting. Not the actor's performance, which was smoothly competent throughout and often spot on in terms of comedic timing. But when the issue of slavery, for example, was raised and dismissed in a sentence and a half, I know this is work not taking history seriously. At all. And as a lover of history, I did resent that. Structurally this came out in the plot as well. As a writer myself, this seemed baffling. Much was made of an old telegram Beau found among his great great grandfather's things from the Civil War, where he served as a lieutenant in the Army of Northern Virginia. The text is in a cypher and Beau desperately hopes to find out what it was, what role his ancestor played. Chip meets the couple, offers to find out, and we learn this telegram may prove that ancestor was a deserter directly responsible for Lee having to surrender days later due to it never having been sent. This is all good! That Beau needs to come to terms with his hopes about the past evaporating--also, the very essence of drama and human conflict. So why is so little made of it? All this becomes more vivid when one considers the story of Lee and those around him, played out in and around the modern story. Lee (Bjorn Johnson) in this version is a man somewhat at odds with my own image of him from history, but he comes across as a brilliant, surprising and deep thinker who is ever ready to act, ever firm in his goals, who bears tremendous responsibilities while refusing to become cold or heartless. His relationship with the young Lt. Colonel Taylor (Shaun Anthony) becomes similar to that of Hamlet with Horatio, someone with whom he can share his thoughts and fears and diminishing hopes. But in many ways the climax of that part of the play comes at the very end--when faced with Grant's call for a surrender, Lee agrees but would rather "die a thousand deaths." Then a Captain Russell (Pierce in a double role) offers another option. Disperse the army and fight it out in guerilla tactics, raiders harassing the Union armies without letup, foraging off the land. Lee all too clearly sees the horrifying long-term consequences of such a path. But that awareness doesn't seem to belong in this play. It seems too large, too important, to serve as a counterpoint to Beau and Jenny's pretty simple marriage problems. The scale of the problems don't mesh, not because the domestic issues between two souls necessarily are tiny, but because in this case they haven't been imbued with the power of Lee's choices and options. So what we get is an enjoyable couple of hours with a few pleasant characters saying some funny lines and settling their differences pretty quickly once they actually start talking about them. Which is fine. But it only plucks at the heartstrings a tiny bit, rather than piercing my heart so I cannot but walk away feeling for the story I've just glimpsed. Nightmares Trio, the four-performance show at ZJU, has its origins in last year's show Nightmares. Like that show, it pretty much epitomizes what I've come to call "Theatre of Dreams." Intuitive in the extreme, with sudden changes of mood, a blending of elements that should not work yet somehow do, Gloria Galvan, Brett Gustafson and Jessica Weiner join musician/composer Christopher Reiner (what--you didn't expect a show explicitly called trio to have only three performers did you?) create something nonsensical yet in some weird way totally logical. So we go from a blend of poetry and dance to comedy skits--costume changes that look like something children would put together (pretty sure that was deliberate--if not, then bravo on the serendipity), musical numbers that end up breaking the fourth wall (one of which sure to earn guffaws from regulars at ZJU), and the like. It is really hard to describe though. Gloria Galvan is a seemingly fearless performer I've seen time and again now, with an ever-increasing range. Apart from the fact she can be utterly hilarious, her range includes a ferocious power. At one point in the show I actually thought to myself "Her eyes alone make me believe she rip open and eat my flesh--and part of me just might want her to!" Brett Gustafson is a tall skinny glass of water with a real edge, as well as (for me very much a selling point in an actor) genuine command of his voice. He, like the rest, literally keeps changing character on a dime and often with a collection of tiny changes in voice and posture and attitude that adds up to someone vividly new. We know when he does this, and he never slips into a previous or future character! Jessica Weiner looks like she should be a cheerleader. Blond hair, big smile, just the right kind of figure. Until you look closer at that smile and those eyes, seeing a just a hint of madness she takes out to play with sometimes, the depths (and heights) she's willing to go that many an ingenue balks before. Tiny detail--of the three she's the strongest dancer. I"ve seen Christopher Reiner before in The Raven, a show I really loved. He's better in this one, not least because he's given much more to do, among other things showing a fine comedic timing in terms of acting (not quite the same thing as telling a joke--and vital in this kind of ensemble performance). Let me note also not only the fine way he performed the music of the show (which he composed) but the fact he played it in sync with the performers! Only three more performances remaining, and I urge those who want a slightly psychodelic and very imagination-expanding piece of theatre to go take a gander. Fast. 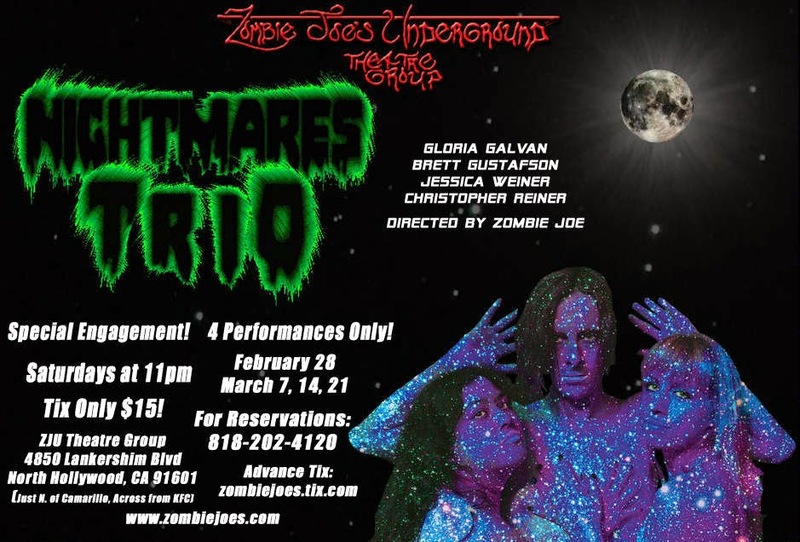 Nightmares Trio runs for Saturdays at 11pm until March 21 at Zombie Joe's Underground Theater Group, 4850 Lankershim Blvd. (across the street from KFC), North Hollywood, CA 91601. For Reservations Call: 818-202-4120, Advance Tix at ZombieJoes.Tix.com. When walking into the Mark Taper Forum to see Arthur Miller's The Price, a feeling of deja vu hit me. Easy to understand. Way back in the 1980s I played the part of Solomon in a production of this precise play at my University. The splendid set, larger and higher quality than anything we could have mounted by an order of magnitude, brought a lot back to me. Maybe because (in part) I've not seen this play since. Honestly, there's a reason for that. 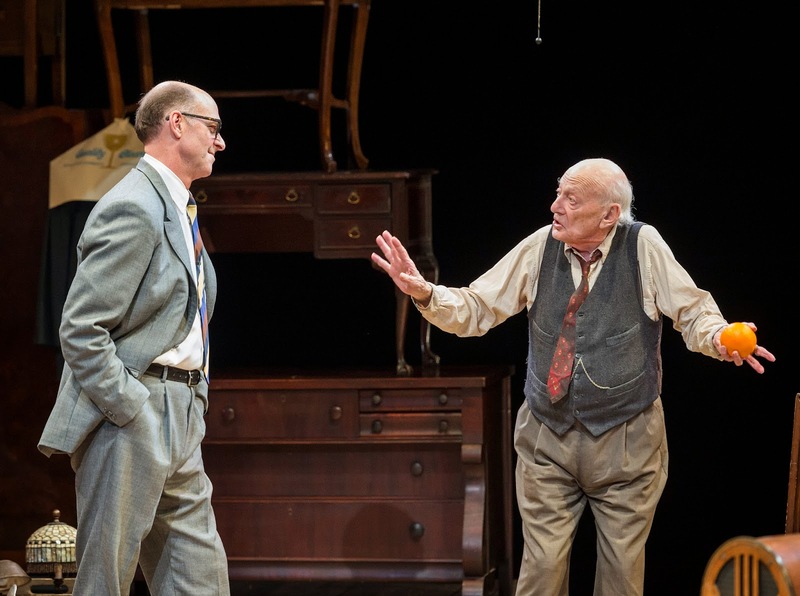 Arthur Miller has made some splendid works, but others than really don't hit the mark. Like this one. Now, let me praise the cast, which uniformly does a splendid job, with one exception. That one exception goes past splendid and hits superlative--Alan Mandell as elderly used furniture salesman Gregory Solomon. But everyone proved great. The plot focuses on NYPD officer Victor Franz (Sam Robards) getting ready to sell the contents of an attic. His father had been a millionaire until the stock market crash of 1929. The family moved to this attic with as much of their furniture as they could manage. Dad died years ago, but now the building is due for demolition. Victor and his wife Esther (Kate Burton) want to sell these antiques for as much as possible. During their conversation all kinds of details pop up. Esther's drinking, for example. Victor's wavering at taking retirement from a job he hates, even though he now qualifies for a pension and might do something new with his life. But what? More, his vastly more successful brother Walter hasn't been returning his calls. The two are seriously estranged. Enter Solomon, to give a bid on the whole attic, including some very nice things. A beautiful harp for example. Here we have a man who seems the exact opposite of Victor--someone who never gave up, having gone broke several times yet is still going. Married four times, most recently at age seventy five! He really is a breath of fresh air, or at least some spice added to an essentially bland story. Of course eventually Walter Franz (John Bedford Lloyd) does show up and even more family history as well as painful secrets emerge. Nothing, it turns out, can be easily explained or simply judged. All three members of the Franz clan start learning and/or confronting things they'd rather not, but must. Not for a single moment did I doubt even one of these characters. I even got a sense of how their dynamic might have worked in the past. They and director Garry Hynes really did wonders with making what is essentially a family argument seems very real and dramatic. But at the end of the day, I didn't like the Franz family. Worse, I didn't find them or their situation particularly interesting. For that I have to put it down to the script, against which the cast struggled and at times rose above. It should have felt dramatic, compelling--a web of deceit and love, loyalty and ruthlessness, awareness and taking sides. Should have. Did not. Which was precisely how I recalled the play before. During the intermission I asked a fellow audience member to imagine this play without the Solomon character--and he instantly saw it would be dull as watching paint dry. Yes, technically one does need to break up the gloom of something like this, but when Solomon (who to be fair fits into the overall story on many levels) becomes the only thing one cares about other than the set...! 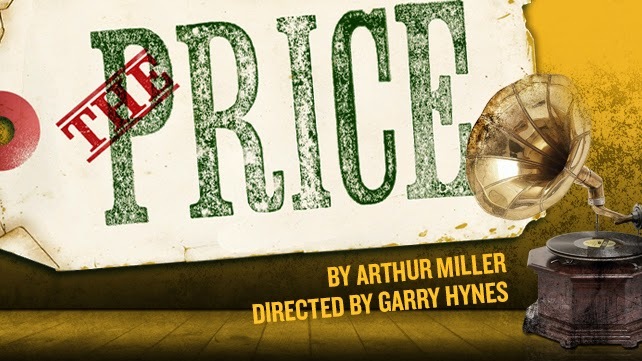 The Price by Arthur Miller runs at the Mark Taper Forum on 135 North Grand Ave. Los Angeles, CA 90012 Wednesdays, Saturdays and Sundays (various times) until March 22. Measure for Measure is one of several of Shakespeare's works dubbed "problem plays" by literary experts. To be fair, plenty of actors and directors agree. It certainly does not easily fall into one of the neat categories of Comedy, Tragedy or History. At least it doesn't feel that way. Off the Rails is based on this "problem play," relocating it in time and space to the Old West. More, it retells the whole story in terms of the Native American experience. This sounds intriguing, at least to me. It frankly proved better than expected overall. Randy Reinholz (Choctaw) did the adaptation, and honestly the result ends up uneven. Let us get the unevenness out of the way right now. The whole thing keeps having sudden changes of mood and feel, at times to considerable dramatic impact but other times I felt yanked out of the story. Having Buffalo Bill's Wild West Show pop up at the end was one, and having it followed by a Native dance was another. The former felt awkward and the latter felt as if it came out of nowhere. Methinks the idea behind it is clear, and let me say that idea seems borderline glorious. But the transition was about as awkward and clumsy as possible. Nor frankly did it help that much of the show was directed in the style of a rather cheesy production of Oklahomah! I'll also point out the exposition at the start filled me with dread. It looked little better than a kindergarden play. Now, though, let me turn to where the play and production not only rose above all that but soared! At its finest this proved in many ways the best Measure for Measure I've ever seen! Start with the how the whole story ends up framed. The frontier, a place were laws alternate between loose and severe. Where vast power concentrates in the hands of the very few, with an even greater divide based on race. Loads of opportunities here, but Rheinholz makes a few dazzling choices. First and foremost, he eschewed turning the equivalent of Vienna's Duke into the lead. This proved brilliant! 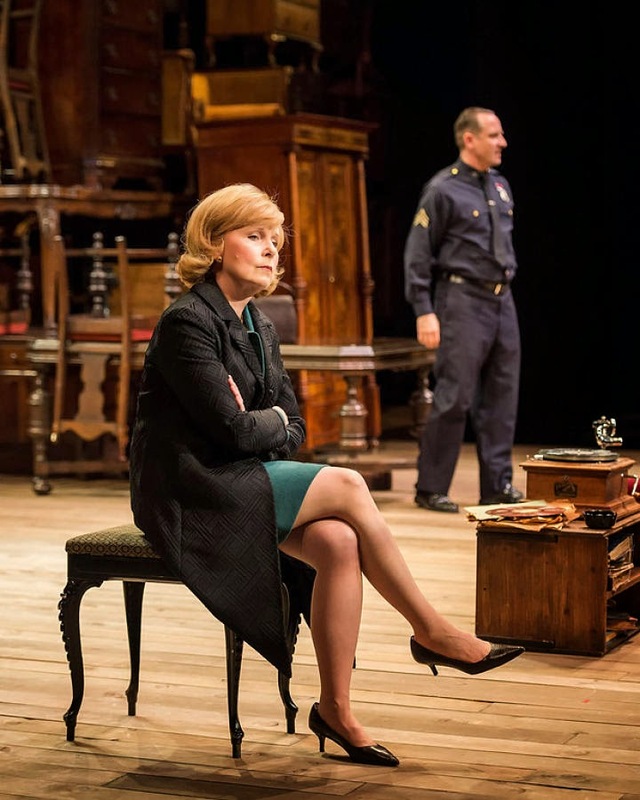 All of his storyline that makes up the bulk of the play then becomes not about a startlingly good and wise man setting right his realm, but about how an oppressed people meet the challenge of a deeply unjust world. 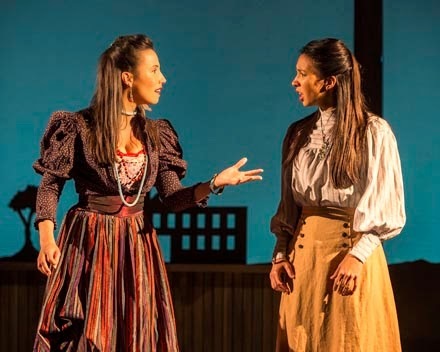 Many of the Duke's lines and actions transfer to Madame Overdone (Shyla Marlin - Choctaw), who also ends up methinks with some variations of lines from Othello's Emilia, cutting ones about women and men. This is good stuff! 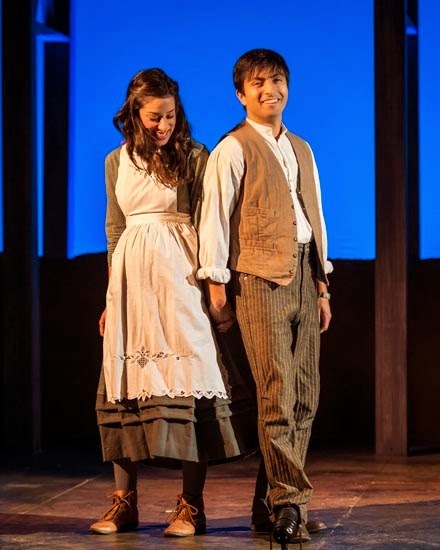 Especially since Madame Overdone's salloon singer proves to be none other than Mariana (Adrieanne Perez), placing her in the action from very early on--a stereotype who suddenly becomes a far more complex person in our eyes once we learn anything at all about her. 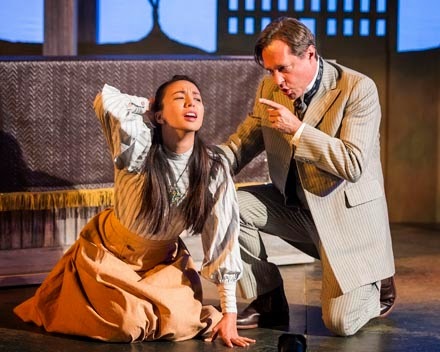 More, now Isobel (Elizabeth Frances - Cherokee) becomes an even more powerful character than she is in the original! Not least because there's no one to offer answers to her dilema, no vastly powerful figure in disguise rendering aid. The Duke, as I said, is gone. She's left on her own in the face of Captain Angelo's self-righteousness and racist lust (Michael Matthys), threatening her brother's life and her own chastity. The scenes between these two rivet with horror, not least because unlike with Shakespeare's play, we don't see a deus ex machina in sight. Parenthetically, I must point out the blocking in these scenes sometimes really interferes. These actors prove themselves very capable of filling stillness with radiant power. Wish they were given more chance to do so! and Juliet. More than his life turns out to be at stake. His identity is under attack, as it has been since childhood, as the Whites have sought to "Kill the Indian, save the Man" by eradicating Native culture. That he fell in love with an Irish girl (Emily Lenkeit) who wed him in a Choctaw ceremony but begged him to do the same in a Christian one brings out more of what makes the original a "problem play." It doesn't give simple answers. What after all really is justice? How does one decide what to do when there aren't any good choices? Does mercy extend only to those whom you like or are like you? Should it? Can it? As noted earlier, the whole production remains uneven, but I strongly recommend audiences to go anyway. This play rises to the level of resplendent more than a few times. The leads do wonders with their roles, and more than once my heart felt pierced with the pain of these characters. 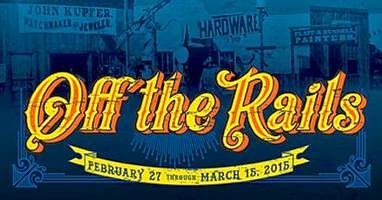 Off the Rails performs Thursdays, Fridays, Saturdays at 8pm, Saturdays and Sundays at 2pm until March 15, 2015 at the Wells Fargo Theater in The Autry Museum in Griffith Park. Actually, no, I'm giving any spoilers in this review. One of the many things I enjoy about ZJU theatre in North Hollywood remains how it keeps experimenting. Not always successfully (if that were true then they'd be playing it safe--not a hallmark of this theatre), but often quite successful indeed. Tales from the Underground marks something new, and something I found quite moving. In essence, one by one a series of individuals associated with ZJU--mostly cast members of different shows--get up and tell a story. The premise seems to be that each recounts something from their personal lives. Simple, really. And oh so fundamentally basic! One can hardly imagine a more primal form of theatre! I'm not going to give away any of these stories. Not one detail. I will say in the course of the one hour show I was moved, a tad horrified, made to laugh out loud, feel a bit of wonder, and a few times felt different kinds of chills up my spine. The storytellers (in no particular order) are Jeri Batzdorff, Jason Britt, Greg Dunigan, Jim Eshom (okay technically he's just the MC), Abel Horwitz, Adam Neubauer and Jessica Amal Sherrie. I listened to their stories and was very glad to have done so. I'm told others will include new stories this weekend! 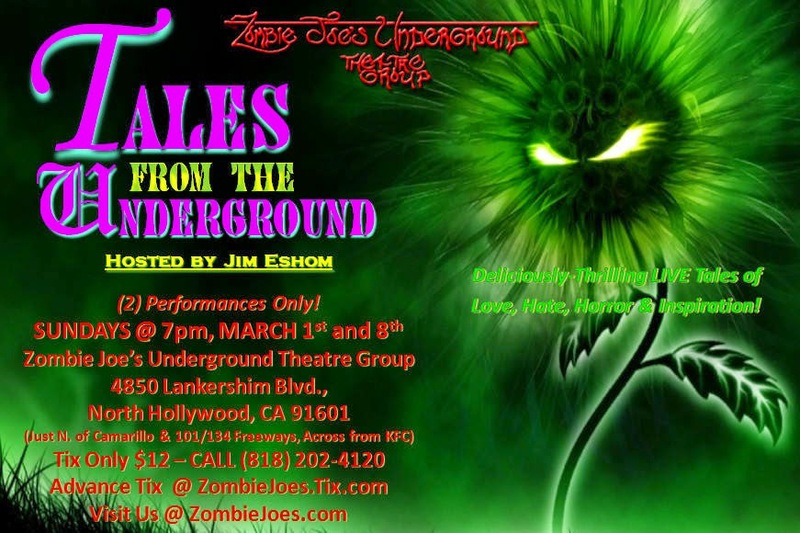 Exactly one more performance of Tales from the Underground will take place, at 7pm Sunday March 8, 2015 at Zombie Joe's Underground Theatre 4850 Lankershim Blvd. (across the street from KFC, just south of the NoHo sign) North Hollywood CA 91601. Tickets are $12 and can be purchased at the door, online at zombiejoes.com or by calling (818) 202-4120. Anyone with much of any knowledge of the Pacific Theater in World War II has heard the name Tokyo Rose. Initially this name assigned to a variety of English-speaking women who made broadcasts on behalf of the Japanese Empire. The actual case of what happened after the war is the stuff of almost mundane tragedy. In 1949 one specific woman was convicted of nine counts of treason for making propaganda on behalf of the nation's enemies. Later investigations indicated many witnesses were pressured to lie under oath. President Ford issued a pardon for the real woman. 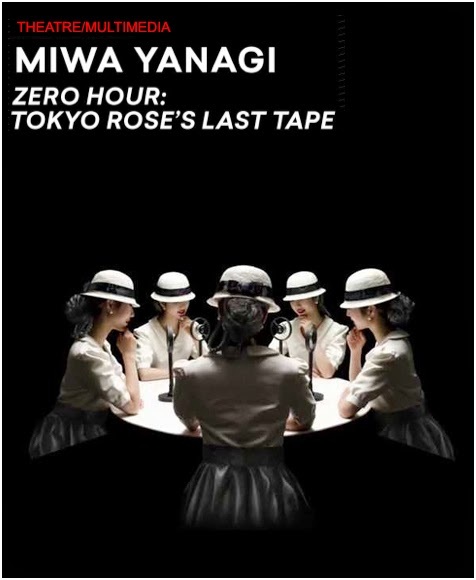 Zero Hour: Tokyo Rose's Last Tape uses this situation as a way to explore something. Names and details are changed in a manner that at times reaches the level of the surreal, especially during long multimedia/dance pieces. This, incidentally, may be the single greatest strength and weakness of what in most ways counts as a compelling, even fascinating performance. Pacing and rhythm. I suspect (cannot really say for sure) that were I more steeped in Japanese theatrical forms, the long multimedia sections would seem to flow with the "story" more smoothly. As it is, I felt distracted. But overall I also felt very interested and moved. 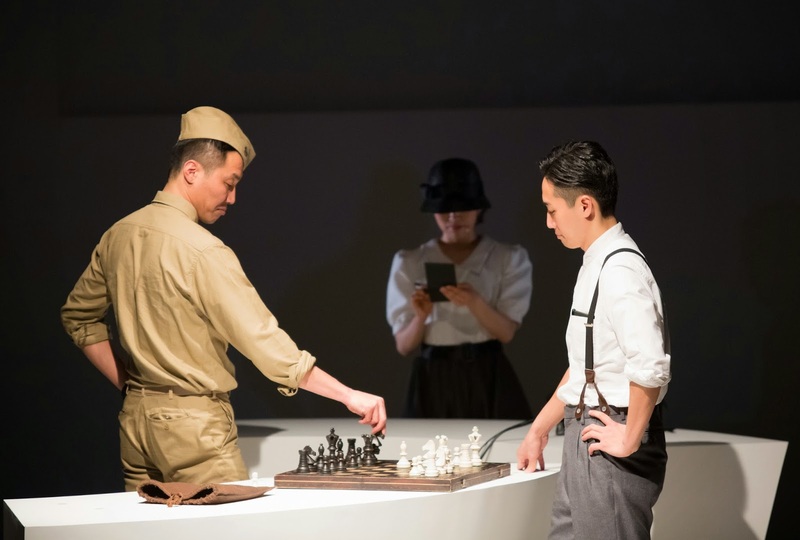 The play ends up focused upon four characters: Jane Sugawa (Ami Kobayashi) an experienced announcer forced to work for the Japanese and also train various typists to announce for the program Zero Hour, Annie Oguri Moreno (Hinako Arao), a Japanese American visiting relatives when the war broke out who becomes tagged and scapegoated as THE Tokyo Rose, Daniel Yamada (Yohei Matsukado) a Nissei US soldier whose life becomes entwined with the mystery of an unidentified "sixth announcer" who made questionable broadcasts, and Toshiya Shiomi (Sogo Nishimura) the sound engineer at Zero Hour who also proves a formidable if unknown grand master of chess. 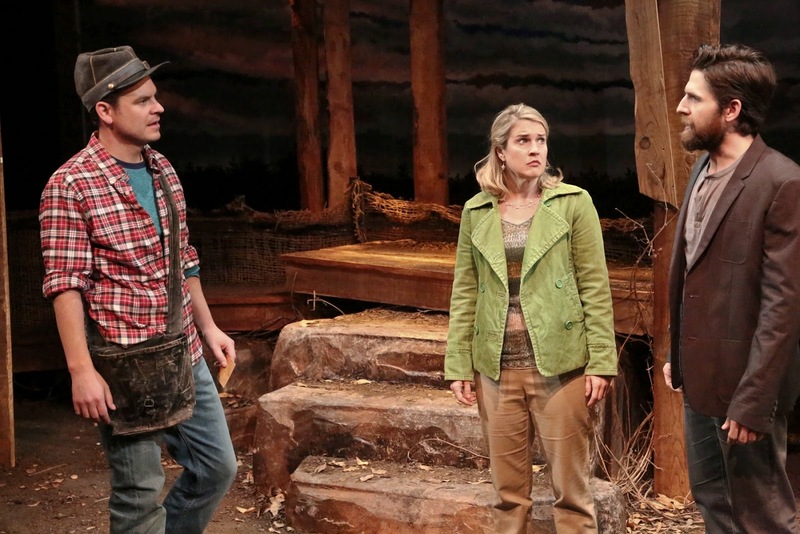 The play moves back and forth, ultimately proving not so much about the injustice of one naive young woman becoming a scapegoat, nor the guilt of two men--one who betrayed her, the other who failed to save her. Rather it seems more than anything a rumination on obsession and identity. We begin with seeing five young Asian women rendered all but indistinguishable, in a circle, wearing identical hats that obscure their faces. A voiceover of G.I.s hear the voice of Tokyo Rose and speculate/gossip over this voice they hear, calling them "fellow orphans of the Pacific." Only later do the hats come off, and individual voices emerge. Long before the climax we the audience have learned to easily distinguish between these voices, while by play's end we hear American judges insist there's no difference between these individuals, that no one can hear the variations in voice. Even that doesn't really touch on the essence of this particular show, however. That would be merely a comment about racism, after all. No, Zero Hour: Tokyo Rose's Last Tape goes deeper. Much deeper, because rather than simply placing blame we're left at the end with evidence our "hero" is guilty of the same error--projecting a desire somewhere so much he cannot even conceive of the truth. As a lovely final touch, we the audience are left in much the same situation as he. A central mystery of events--specifically why a certain someone did what he did--remains without a solution. Then what are we left with, but objectifying what we do not understand, imposing our own desires onto the unknown?